Not much to it: two struts, two hinge brackets, and two ball studs. Faced with $4 for a new *MAZDA* hood prop clip that I broke during installation of a single turbo conversion I decided to splurge and buy the Rotary Extreme hood prop kit. I had a marker for a discount at RE that I could call in so given the discount I decided to go ahead and buy the kit. 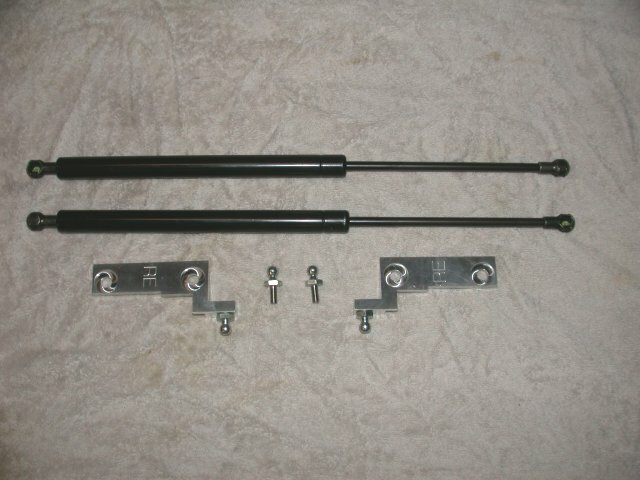 The kit is simple in execution as it really isn't much more than some special brackets and a pair of gas stuts. 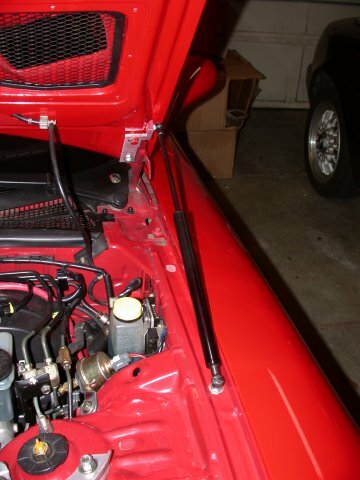 Installation is advertised as simply bolting the strut bracket to the hood hinge mounting bolts and replacing a fender bolt with the new ball stud. So I did that...in all of about 15 minutes. Cool! Then I go to shut the hood...and IT WON'T SHUT! Rats! The kit is advertised as "designed to be installed without any permenant modification to your vehicle or the hood" and "working safely with either the stock hood or an aftermarket hood." Apparently working safely and fitting perfectly are not the same as the kit certainly did NOT fit with my aftermarket hood. So much for a 15 minute installation. If I sit on the hood it will close! Note bowing of hood over hood prop. UGH! Don't look...that is one DIRTY CAR! So....seems as if the outer portion of the hood bracket was hitting my fender rain gutter. By placing a small blob of putty one can see where the interference issues are. So with the interference identified, the fender is marked, and out comes the dremel tool and cutting wheel to extract the offending sheet metal. A bit more judicious pounding on the fender rain gutter and the gas struts would sit marginally low enough to allow me to close the hood. It is tight...very tight. Hood brackets installed...no problems there. 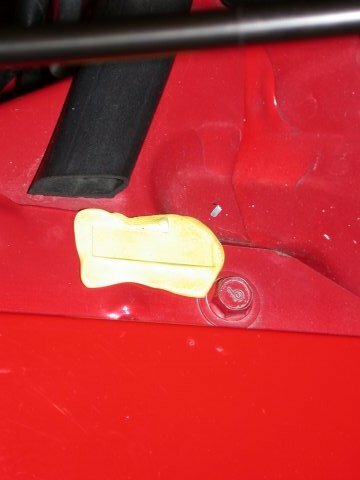 Putty showing where bracket was hitting fender rain gutter. 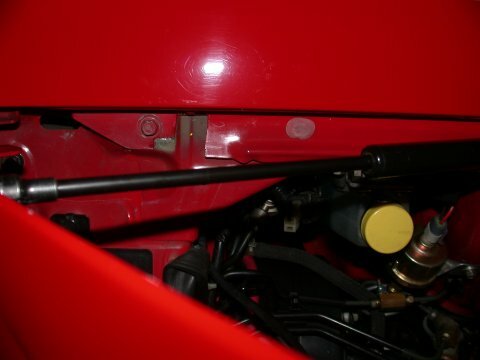 Notching of the fender where the hood bracket ball stud sits. And I have to say I was very much against hacking of my fenders to make these purely cosmetic items work. But in any case what's done is done and they are now installed. 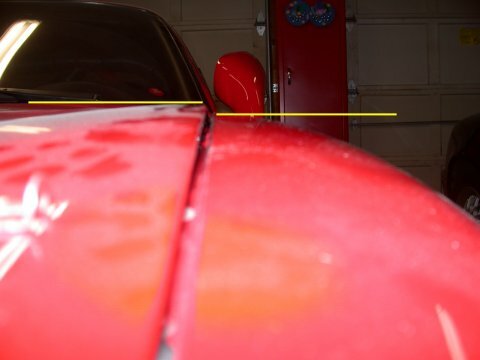 Just be prepared for fitment issues when fitting to an aftermarket hood. I have no doubt that it will fit with a stock hood but an aftermarket hood, you are taking a chance. Final installation...2 hours later. No more stock hood prop.